Mister Rogers arrives with a record called Laughs. 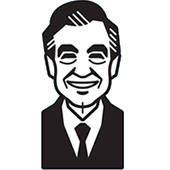 The recording consists of a man laughing which makes Mister Rogers, himself, laugh as he plays it. Mr. McFeely stops by and informs Mister Rogers that a local television station will be airing a film about sea gulls and Mister Rogers is in the film. After Mister Rogers plays the Laughs record for Mr. McFeely, they set a timer and wait a full minute for the film about seagulls to begin. They watch the film on a television set near the front door. Visiting Negri's Music Shop, Mister Rogers meets Phyllis Susen who demonstrates different types of harps. 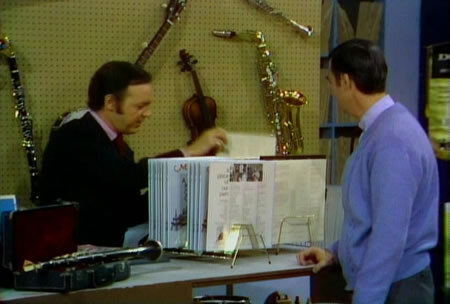 Before leaving the shop, Mister Rogers buys a record of harp music. In the Neighborhood of Make-Believe, Lady Aberlin and King Friday watch as Lady Elaine Fairchilde is interviewed on television. Disinterested in Lady Elaine's comments, King Friday changes the channel and suggests that Lady Aberlin go to the Museum-Go-Round. At the Museum, Lady Elaine reveals that while she was on Jupiter, she discovered a new planet -- Planet Purple. After the interview, Lady Elaine shares a "photo" of Planet Purple showing that everything there is purple and everyone looks the same. Back at the house, Mister Rogers talks about how everyone on Planet Purple is the same. He plays his new record of harp music and then a record of accordian music to show that variety is good. He concludes by singing It's You I Like. Let's Be Together Today plays in the background as Mister Rogers goes to Negri's Music Shop. The record of harp music costs Mister Rogers $4.00. Copies of the 1970 release of A Place of Our Own (Album) can be seen on display at Negri's Music Shop. The reporter interviewing Lady Elaine is Jack Bogut. Mr. Bogut was the longtime host of the morning show on Pittsburgh's KDKA radio. In 2011, he was inducted into the Broadcaster's Hall of Fame. The cameraman filming the interview was played by John Butler. Mr. Butler provided audio services on several episodes of Mister Rogers' Neighborhood and occasionally visited the Neighborhood on camera. When King Friday rudely changes the channel on the television set, the TV shows the boring stock program he forced everyone to watch in Episode 1208 and Episode 1209.